This past year, I ran three marathons during the spring over 6 weeks - Antarctica, LA and an ultra in Seattle. I had so much fun that I decided to do that again. So, on March 18, 2012, I'll be running the LA Marathon for the 4th time overall and 3rd time on the Stadium to the Sea course. The course winds from Dodger Stadium, east to downtown and then west through Echo Park, Hollywood, West Hollywood, Beverly Hills, Century City, Westwood, The VA Center, Brentwood and Santa Monica finishing above the Pacific Ocean. I cannot recommend this course more highly; I would even say traveling to LA to run it makes sense. I plan to run it every year, and I'm happy that I like my hometown race. Then, 5 weeks later, you can find me slamming through grand ole London, England in the 2012 Virgin London Marathon. So, April 22, I'll take off on a 26.2 mile adventure across a city I lived near for a year and happen to still enjoy visiting. Thanks to meeting the head of the organization on a plane last year, I'll be supporting Rays of Sunshine which is like Make-a-Wish. I have specific fund raising goals and my British friends should be putting my email on their spam list to avoid my pestering pleas for donations. The 2012 Summer Olympic Games will be in London, and this event promises to be special. In fact, the official 26.2 mile distance of all marathons was established at the 1908 Olympic Games. Previously, the distance ranged from 24 to 28 miles. 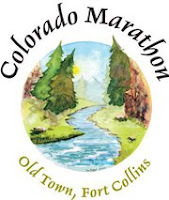 And 2 weeks further on, I return to Fort Collins, Colorado to run in their racing event on May 6, 2012. After 3 half-marathons in the past 5 years, I'm taking on the full marathon this time. Registration is open for this too at the 5k, 10k half and full distances. My cousins live in Fort Collins, and the amazing course winds out of Poudre Canyon before finishing in Old Town, Fort Collins. Very exciting. We can't wait to hear more about all 3 races. Love you and we will be at the finish line for the Colorado Marathon. Love you "Big Bro"
Run 1. Sleep 0. I Win.